Toasted marshmallows are the essence of summer. Roasted over a campfire and eaten plain or in a s'more, they're simply delicious. 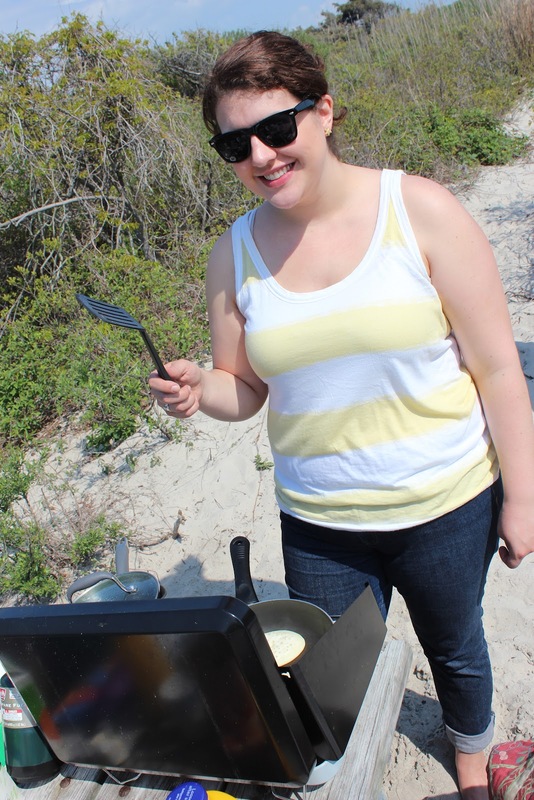 This past weekend, a bunch of us went camping on Assateague island, and I just knew I had to try making marshmallows from scratch for the occasion! The trip itself was great (despite being cut a day short due to a nor'easter). 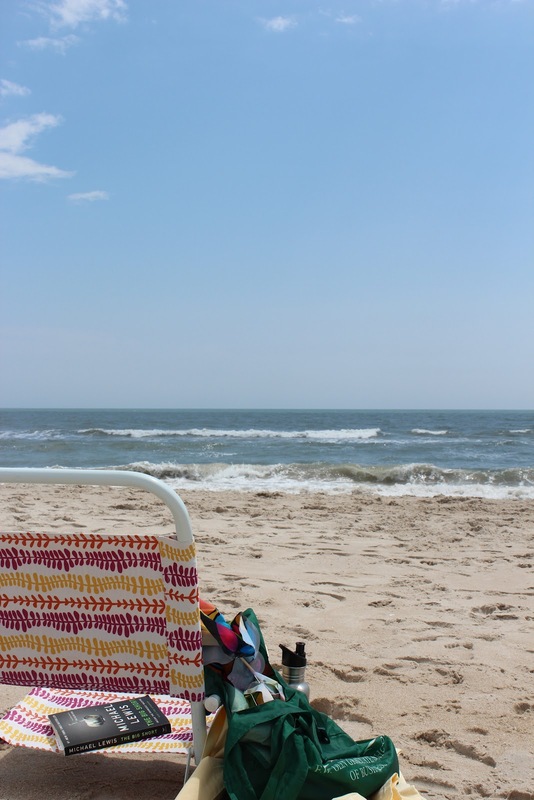 Falling asleep to the sound of waves crashing, bare feet in the sand, wild ponies, lots of sun, puppies, and a great group of friends - nothing beats it! 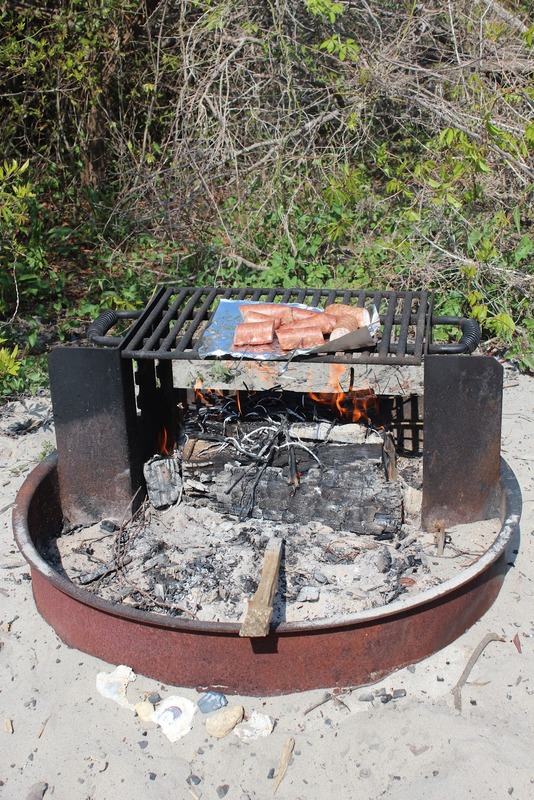 There was lots of cooking too. For breakfast we whipped up some shake and pour pancakes, over the course of the weekend we ate a full 5 pounds of Polish kielbasa a, and there were lots of hot dogs, hamburgers, and (of course) s'mores. My favorite, of course, were the marshmallows. And truth be told, there weren't even that difficult to make! 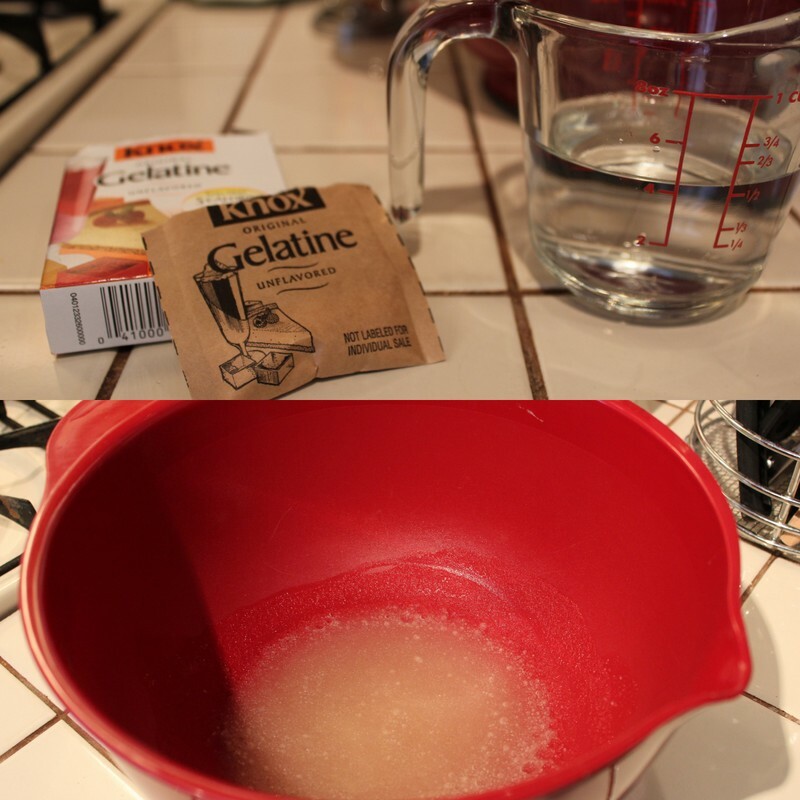 To start, pour 3 1/2 packets of gelatin over 1/2 cup of cold water in a large bowl (the bigger the better). Don't stir it! And set it aside. 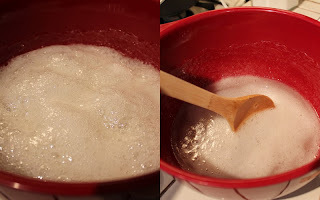 In a medium saucepan, mix the remaining 1/2 cup of water, the granulated sugar, corn syrup, and salt together. Cook it over low heat, stirring constantly, until the sugar is dissolved. 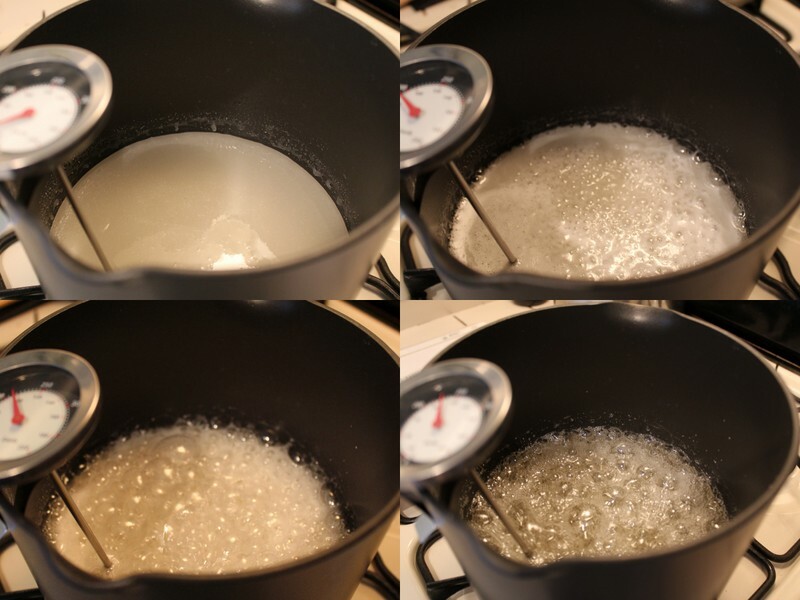 Using a candy thermometer and without stirring, turn the heat to medium high. Let the mixture come to a boil and wait for it to reach 240 degrees. This took about 15 minutes for me. It will start to bubble, then get extremely foamy, and then shrink down into a clear liquid. Once you've reached your 240 degrees, remove the sugar mixture from the heat and pour it over the gelatin. This is what you'll turn into marshmallows. At first, the concoction will foam up as if it's a living thing, and from now on, you're pretty much dealing with a white version of The Blob that will try to overtake anything it touches. Stir The Blob until the gelatin is dissolved. Using a hand mixer or a stand mixer if you have one (a stand mixer is immensely easier, but a hand mixer is definitely manageable - it's what I used), beat The Blob on high speed until it is fluffy, white, and stiff. With a hand mixer this should take you about 10-14 minutes, depending on how powerful the mixer is, and should only take about 6 minutes with a stand mixer. Note how The Blob overtook my entire beater - but don't worry, it wipes off easily. In a separate bowl and using clean beaters (cold beaters that have been sitting in the freezer are helpful here, but not necessary), beat the egg whites until they form stiff peaks. Mix the egg whites and vanilla into The Blob until just combined. 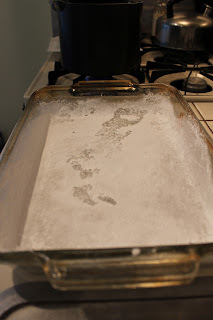 Prepare a 13x9 inch baking pan by greasing it and coating it with confectioners' sugar. Pour The Blob into the prepared pan. Don't worry if you can't scrape it all out - the mess that you'd create is not worth getting every last drop! Plus, you can lick the bowl later. Sprinkle it with 1/4 cup confectioners' sugar and refrigerate until it's firm to the touch, for at least 3 hours. Once the marshmallows (they're much more manageable now - no more Blob!) are firm, remove them from the baking pan by holding the pan upside down over a cutting board and gently pulling the marshmallow out. Also, don't wear black clothing while you do this, unless you're wearing an apron (I learned this one the hard way). Using a greased pizza wheel or butcher knife, cut the marshmallow into 1 inch cubes. Toss them in the remaining confectioners' sugar so they don't stick to each other. Now light the match and start up that campfire, because these marshmallows will be begging you to roast them! Pour 1/2 cup cold water into a large bowl or an electric mixer, sprinkle with gelatin, and let stand. In a medium saucepan, mix 1/2 cup cold water, granulated sugar, corn syrup, and salt. Cook over low heat, stirring, until sugar is dissolved. Increase the heat and bring to a low boil. Without stirring, cook until it reaches 240 degrees, then remove from heat. Pour the sugar mixture over the gelatin and stir to dissolve gelatin. 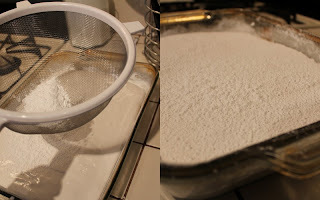 Using a hand mixer or the whisk attachment of an electric mixer, beat on high speed until fluffy, white, and stiff (about 10-14 minutes for a hand mixer and 6 minutes for a stand mixer). In a separate bowl and using clean beaters, beat the egg whites until they form stiff peaks. Mix the egg whites and vanilla into the marshmallow mixture until just combined. Prepare a 13x9 inch baking pan by greasing it and coating it with confectioners' sugar. Pour the marshmallow mixture into the pan and spread evenly. Sprinkle with an additional 1/4 cup confectioners' sugar. Chill until firm, uncovered, for at least three hours. Once the marshmallow is chilled, remove it from the pan by holding the pan upside down over a cutting board and gently pulling the marshmallow out. Using a greased pizza wheel or large knife, cut the marshmallow into 1 inch cubes. Toss the cubes in the remaining confectioners' sugar. Store at room temperature or chilled in an airtight container for up to one week. You're so impressive. I don't know how you have the patience to make things like this. I would never be able to. I hear you - camping, the beach, and horses fulfills most of my childhood dreams! We went to Assateague Island National Seashore (just south of Ocean City, MD), where there is an actual campground. It fills up pretty far in advance, so I'd look now for something this fall. Maybe we can have a little Mexico reunion there? ?